The Flores Settlement Agreement is a court settlement, in place for over two decades, that set limits on the length of time and conditions under which children can be incarcerated in immigration detention. In September 2018, the Trump Administration proposed regulations that seek to terminate the Flores Settlement Agreement’s legal safeguards for children, including the provision that children must be transferred to a non-secure, licensed facility within three to five days of apprehension, which has been interpreted to allow for an extension of up to 20 days in times of “emergency” or “influx.” The proposed regulations include a number of policies which, if implemented, would allow the government to incarcerate more families for even longer periods of time. 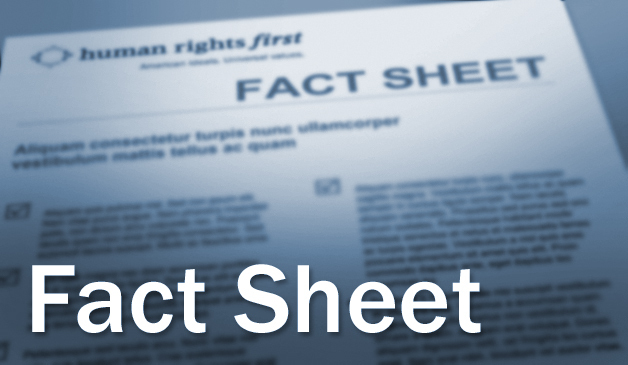 This factsheet presents a brief history of the 1997 Flores Settlement Agreement as it relates to children incarcerated in family detention centers with an accompanying parent or legal guardian. Following an overview of recent developments under the Trump Administration, Human Rights First offers recommendations for upholding the rights of children and their parents whom the government seeks to incarcerate for indefinite and prolonged periods of time. In 1985, two organizations filed a class action lawsuit on behalf of immigrant children detained by the former Immigration and Naturalization Service (INS) challenging procedures regarding the detention, treatment, and release of children. After many years of litigation, including an appeal to the United States Supreme Court, the parties reached a settlement in 1997. The government is required to release children from immigration detention without unnecessary delay in order of preference beginning with parents and including other adult relatives as well as licensed programs willing to accept custody. According to advocates, as well as the Department of Justice Office of the Inspector General, the INS did not immediately comply with the terms of the Agreement. It was only after the Office of Refugee Resettlement (ORR) assumed responsibility for the care and custody of unaccompanied children in 2003—a product of years of advocacy on the part of human rights organizations, religious groups, and political leaders—that significant changes were implemented.